A Boston-raised, NYC-made trio who take pop, folk and R&B influences and bake them together in a dreamy blend of Brooklyn indie. Kelly Zutrau, Joe Valle and Marty Sulkow make very deliberate stylistic choices to make music that sounds like a beautiful accident. Their seemingly unlikely mix of genres manages to make Wet sound both familiar and totally fresh. Formed in 2012, these former art school kids have spoken previously about their desire to write great pop songs. On their long awaited full-length album, that’s exactly what they do – albeit with a healthy dose of electronic-synth cool on songs such as ‘You’re the Best’. Singer Zutrau’s voice will evoke favourable comparisons to Wet’s former labelmates Haim or their tour buddies Chvrches, but her lyrics on the break-up anthem ‘Don’t Wanna Be Your Girl’ make it clear she worships at the feet of Queen Beyoncé as well. 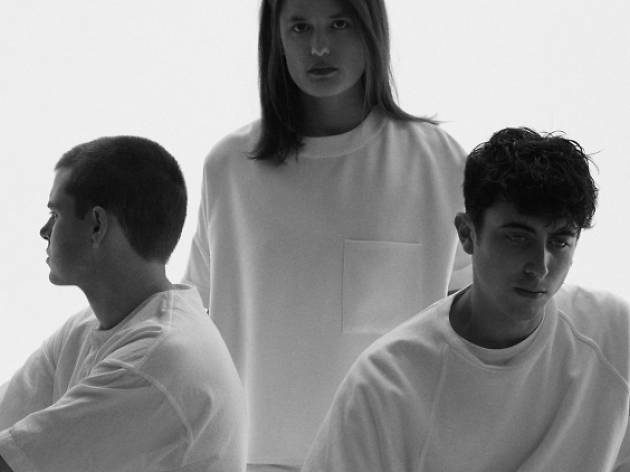 In a time when mainstream pop and leftfield indie acts are borrowing from the same sources, collaborating with the same people and happily nestling side by side on playlists, Wet are very much a product of their environment. Their upcoming debut album ‘Don’t You’ (due before the end of the year) beautifully balances wide pop appeal with gorgeous, wistful originality. Sarah Taylor, 33, is an account director. She profiled Wet as part of the Time Out Takeover. Follow her on Twitter @sarahmtaylor.